Made in England by Staffordshire pottery Rosina, under the label Queen's Pottery label, which Rosina purchased in 1928. This pretty teacup and saucer has a mark which dates it to around late 1950s or to the 1960s, underneath both the teacup and the saucer. The pretty transfer printed pansy pattern is from the 'Special Flowers' range, for the month of August. 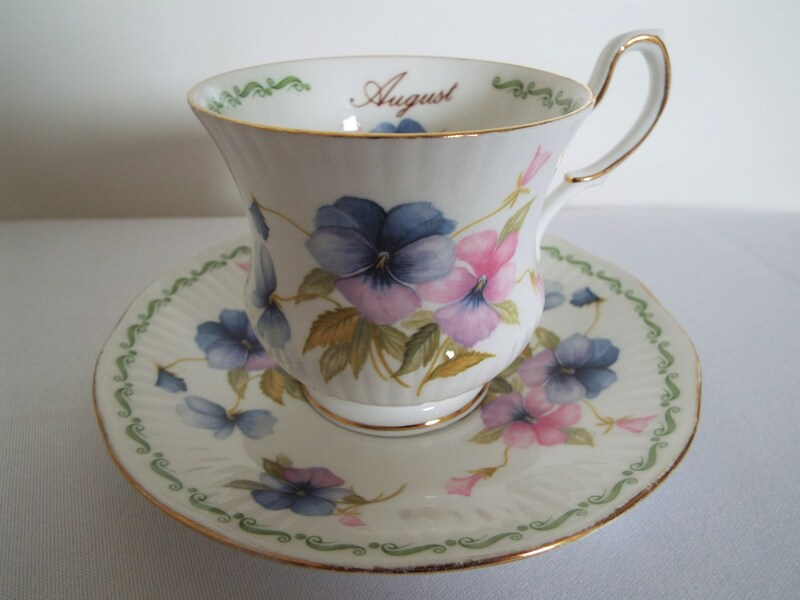 Pink and lilac-purple pansies surround the teacup and saucer, along with a smaller pansy image inside the teacup beneath the word 'August'. A green scrolling pattern flows around the saucer rim and the inside rim of the teacup. The pattern and colours look very pretty against the bright white of the china. The elegant shape of the teacup and moulded ripples on both the outside of the teacup and on the saucer, add to the prettiness of this set. A dainty little teacup and saucer, it would make such a wonderful gift, especially for an elegant teatime or for a special occasion such as an August birthday. In good vintage condition, with no chips, cracks or crazing, just some wear to the rim and handle gilding in places, due to use and completely commensurate with age. Any further wear there may be is commensurate with age. Please just ask if you would like further photos. Your teacup will arrive carefully packaged and beautifully wrapped in vintage style brown paper and ribbon, at no extra charge. Please read my shipping policies before ordering. I ALWAYS refund shipping over charges if they arise as a result of combining multiple items. If ordering multiple items I will combine them where possible and most cost effective and always refund any shipping overcharges. Vintage Green Milk Jug Or Creamer. 1950s Johnson Bros Green Jug With Strawberry Pattern. Perfect For A Tea Party Or Strawberries And Cream!